Join us, brave adventurers, as we put four superhero characters through their paces in Cryptic's Champions Online. Fear the trickery of Bullshot! Feel the blades of Becca Danger! Generally look out for Super Crecente! 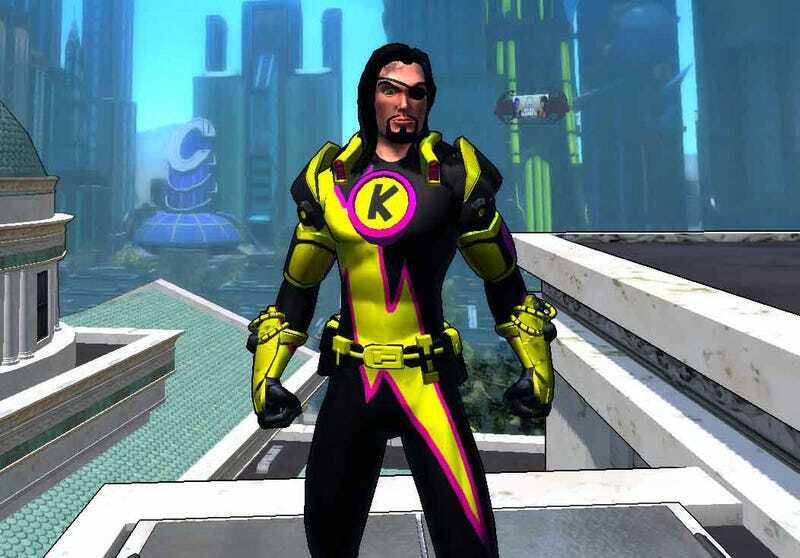 The early head-start for Cryptic's new superhero MMO Champions Online kicked off this weekend, and despite having many other plans, I couldn't resist the siren song of the spandex. Finding myself awake far too early on a Saturday morning, I couldn't help my hand as it opened up Games Explorer and double-clicked on the Champions icon. Soon I was strapping on equipment, fastening my cape, checking my weapons, and in two cases growing a pair of breasts as I dived headlong into the world of Champions Online. I've always had a weakness for superheroes that used bows, so archery was my first choice of powersets to explore. I started off with images of Hawkeye and Green Arrow in my head, but the game's expansive character creation tool soon led me in an entirely new direction. I am not quite sure how I ended up trying out horns on my archer, but they fit perfectly. A nice brown color scheme later and Bullshot was born. Champions Online isn't quite the sort of persistent world MMO we're used to. It's made up of adventure instances, sort of like comic book issues, where a certain number of characters can play before a new instance is spawned. The starting zone, for instance, is set during an alien invasion of Millennium City. The player progresses through a series of quests that ultimately leads to an instanced mission, and then they progress to the next area of their choosing. Bullshot had some troubles early on, as I hadn't quite grasped how the powers work. Basically you have one power that builds up energy, and other powers that use said energy. It's sort of like the rogue in World of Warcraft. You build up power using your weaker attack in order to unleash the big guns. Not quite understanding this, Bullshot died quite a few times. Eventually he got to a public mission, which works a lot like public quests in Warhammer Online. A series of tasks is presented, such as kill 20 aliens, and all players participate until the next task is given. At the end of the quest the players are ranked and awarded prizes based on their participation. Having done terribly, all I got was a lousy health kit. Then came the instanced mission, where the real foe behind the invasion is uncovered. It's your first encounter with a supervillain, and if you know what you are doing it isn't too hard, especially with a high-powered NPC at your side. Needless to say, I died several times. Luckily the supervillain's health stayed where it was when I bought it, so killing him was only a matter of running back to finish him off. After the grand finale of the alien invasion arc, I was presented with two different storylines to pick up - Canada or the desert. Choosing Canada, I was transported to a snowy base in the middle of nowhere, and urged to purchase my first new powers in six levels, along with a travel power. Eager to test out travelling, I chose swinging, thinking that shooting a bow with a line attached would fit Bullshot perfectly. I spent about an hour after that just swinging around, casting my line out to the empty sky, and generally having a blast before I decided to take a nap. I'm also a fan of superheroes who are just normal people with a few extraordinary powers. Rather than continue with Bullshot, I created a female character. A simple girl with a t-shirt, jeans, a pair of swords, and big, clunky rocket boots. I showed the design to my girlfriend, who suggested I name my creation Becca, after the real name of Tank Girl. Craving a bit more of a twist, I added Danger as a last name, and Becca Danger was born. Now that I had the hang of things, the tutorial level flew by in an hour, with nary a death. The dial swords powerset is unique in that many of its powers hit more than one enemy at a time, so I was tearing through aliens like there was no tomorrow. Finishing the opening in no time flat, I chose the desert this time around, granting Becca a few new powers and of course, activating those rocket boots. Rocket boots are the fastest travel power, though they activate in stages, to keep things fair and balanced. Once you get up to speed, shooting around the sky is extremely entertaining. The desert storyline involves freeing a research facility from radioactive mutants. I got Becca to level 9 by the end of the arc, though I did have to team up for one particularly difficult quest. My Champions Online team experience lasted all of 2 minutes, and we disbanded as soon as the boss monster was down. Otherwise, Becca was flying solo. Once that arc completed I was delivered into a new, more expanded desert instance, with the facility rebuilt. New missions and more exploration awaited, but that would have to wait for the next issue. Sunday was a brand new day, and a brand new heroine was born. Inspired by Peter Milligan and Mike Allred's stint on X-Force (renamed X-Statix before cancellation), I went with a rather quirky design for Onyx. Completely black, this powerhouse character wears the outfit of a classic 1970's superhero, with her red glasses the only discernible facial feature. Very, very Allred. Fortunately for me, Onyx proved more resilient than the characters of X-Statix, again breezing through the tutorial mission in record time, thanks to her uber-toughness and her powerful arsenal of punches. Again I chose Canada, giving her the earth flying power to coincide with her geological origin. Hovering about on a dislodged chunk of earth, I took on all manner of ice demons and ice zombies as I struggled to free the ice outpost from the ice evil. As it was getting late, I couldn't see the mission through to completion, and my girlfriend wanted to watch Kate & Leopold. Not wanting any more ice, I decided to go with her plan. This morning I woke up early, and having a little bit of free time I decided to make one last hero. The gadgeteer in pink and yellow, his long tresses as much a weapon as his sonic blaster, Super Crecente arrived on the scene, taking down aliens as easily as if they were notes at a press conference. I am not sure how he lost his eye, but I bet it was painful. My time in Crecente's shoes was short, as he has much smaller feet, and I actually enjoyed the concept of the gadgeteer power set and didn't want to be locked into being Super Crecente until the end of time. Those four characters represent about 13-14 hours worth of Champions Online. I'd say I had a bit of fun, though there wasn't much in the way of chatting going on, so I couldn't really gauge the community. With the game going live for everyone tomorrow, I expect that to change. Feel free to hit me up in game if you'd like to take out a few mutants together. Just be warned that I have serious alt-character disease, so there's no telling who I'll be when you finally catch me.